US ambassador to Israel rips Palestinian Authority, Hamas for 'celebrating' terror attacks on Israelis, compensating terrorists' families. 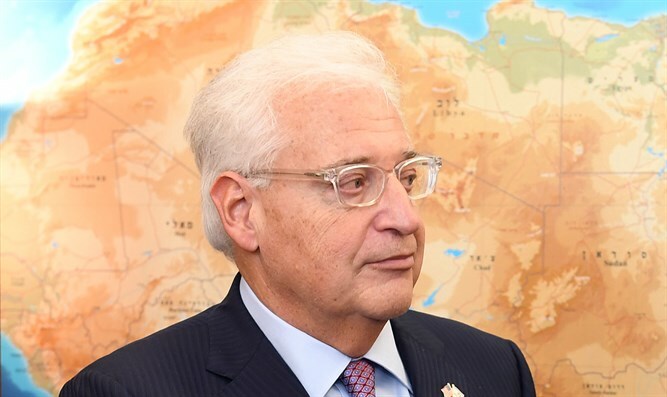 US Ambassador to Israel David Friedman excoriated the Palestinian Authority and the Hamas terrorist organization Monday, denouncing their support for terror attacks on Israeli Jews. In a tweet Monday, Friedman said that while Israel aggressively prosecutes its citizens who engage in nationalistically-motivated attacks, the Palestinian Authority celebrates Arab terrorists, and even provides them with funding after they’ve been captured. Friedman spoke out in response to the string of deadly terror attacks in Samaria Sunday, which left 19-year-old IDF soldier Gal Keidan, and 47-year-old father of 12 Rabbi Ahiad Ettinger dead. A third Israeli, an IDF soldier named Alexander Dvorsky, was seriously wounded in one of the attacks. In a second tweet, Friedman referenced celebrations in the Gaza Strip orchestrated by the Hamas terror organization following Sunday’s attacks. Friedman also condemned the Palestinian Authority for its policy of funding jailed terrorists and the families of slain terrorists – a policy Israeli leaders have denounced as “pay-to-slay”. On Sunday, a Palestinian Arab terrorist stabbed and shot 19-year-old IDF soldier Gal Keidan to death at Ariel Junction in Samaria, stole his firearm, and proceeded to open fire on Israeli vehicles before stealing a car and driving west to Gitai Avisar Junction, where he shot and wounded a second IDF soldier. Forty-seven-year-old father of 12 Rabbi Ahiad Ettinger was critically wounded in the attack. On Monday, Ettinger was declared dead. After news of the attacks reached the Gaza Strip, supporters of the Hamas and Islamic Jihad terror groups were spotted handing out candies and pastries to celebrate Keidan’s murder.